Tasty and unique spin on a classic with Grilled Mexican Shrimp Cocktail. 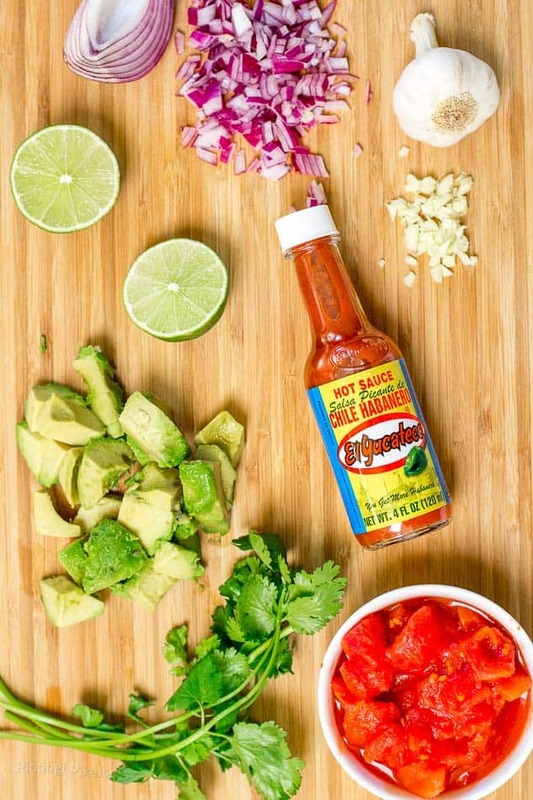 Perfect end of summer recipe of grilled shrimp, tomato base, avocado, cilantro, lime and hot sauce. Shrimp cocktails are a flavorful, healthy appetizer, usually only ordered at restaurants or served occasionally at parties. How do you make them part of your early fall fun? Grill the shrimp of course. Personally I enjoy grilling year-round, weather permitting. Rich, smoky flavor brings out even more flavors for this Grilled Mexican Shrimp Cocktail. Grilling the shrimp brings a hands-on aspect and invites a collaborative effort between friends or family. Watch your guests salivate as they wait for perfectly grilled shrimp to mix into their sweet and spicy shrimp cocktail mix. This recipe features a unique tomato mixture made mostly from scratch. 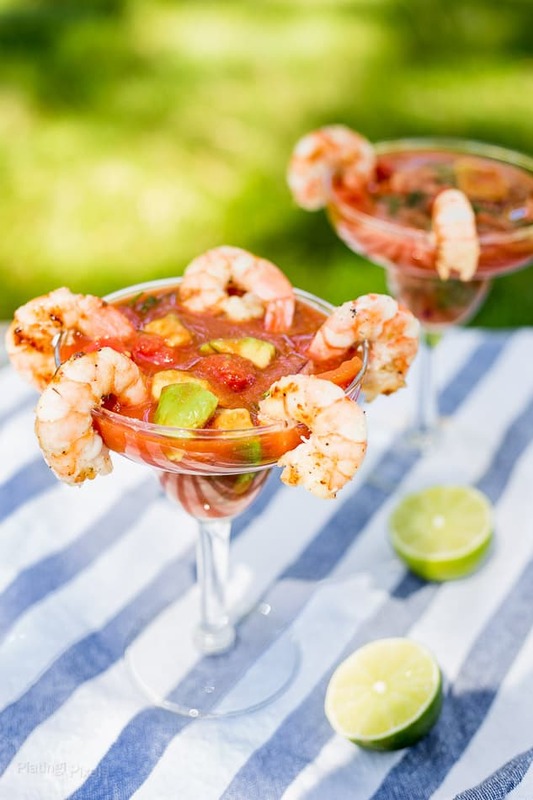 Traditional Mexican Shrimp Cocktail recipes feature a pre-made clam and tomato drink, which you could use. 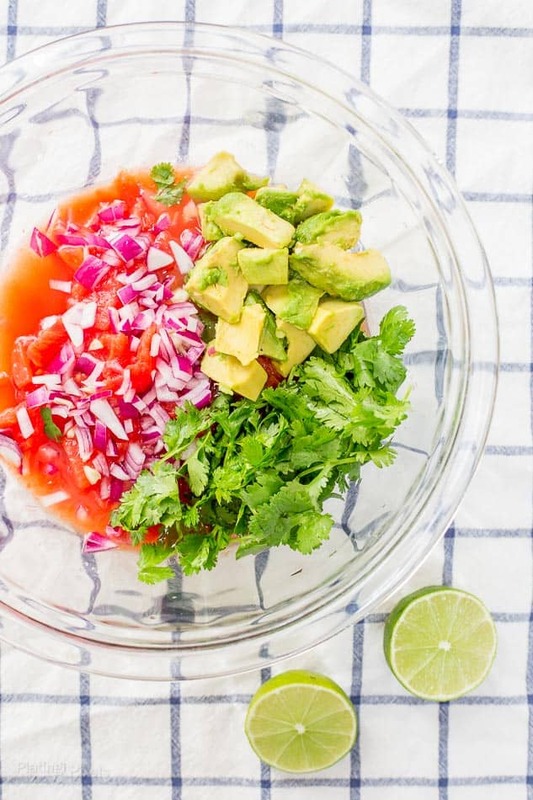 If you want a more natural ingredient base then use an organic vegetable juice blend and simply add ingredients like diced tomatoes, minced garlic, red onion, cilantro, squeezed lime juice, horseradish and organic ketchup. Don’t forget a good amount of avocado for that signature chunky Mexican Shrimp Cocktail texture. Adding to the theme of Mexican Shrimp Cocktail, I used El Yucateco Red Habanero Hot Sauce. 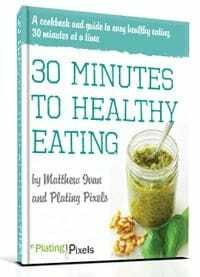 A full 2 tablespoons adds a flavorful, spicy kick. It’s made with fresh red habanero peppers, tomato and signature spices and seasonings. It’s a great all purpose sauce that’s spicier than most, but with less vinegar flavor; ideal for a recipe like this. Flavor profiles: Tangy, spicy and umami paired with savory grilled shrimp. Texture: Moist tender shrimp, creamy avocado in a chunky tomato cocktail sauce. Dietary options/substitutions: Use more or less hot sauce depending on desired spiciness. Preferably use organic vegetable juice, tomatoes and ketchup, as well as natural horseradish. A unique twist on classic shrimp cocktail makes a perfect summer recipe. Preheat grill to medium-high heat. Place shrimp in a large bowl and toss with olive oil, salt and pepper to coat. Lightly grease grill and cook shrimp 2-3 minutes per side, until cooked through and slightly charred. Tip: use a grill basket or skewers to prevent falling through grates. Remove shrimp and cool slightly. In a clean bowl, stir together remaining ingredients until combined. Place desired amount in glasses or bowls. Peel tails off shrimps (optional) then place on edge of prepared glasses and serve. Could I add cucumber to this or even celery? I love shrimp cocktail and you’ve just reminded me that I haven’t had it in the longest time! I love your creative spin on it! I sometimes go long stretches without having it to. Glad to help and thanks Annie! I’m ALL about a good shrimp cocktail!! Love your fresh ingredients & that hot sauce! That’s what I was going for. Thanks Gwen! Haha I like you enthusiasm! Thanks Dini! I love shrimp. This is such a beautiful presentation and delicious recipe! 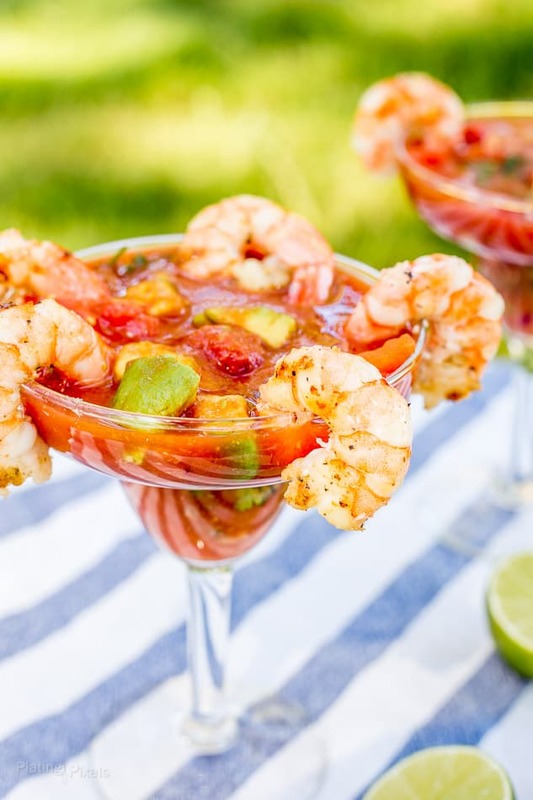 My Dad always enjoy a good shrimp cocktail and I think he would be so happy if I made this for him! I love how fresh your version is, with added avocado! I think avocado and shrimp go together wonderfully. I’m sure he would be and thanks Emily! What a perfect looking colorful summer snack. I love the addition of El Yucateco sauce in it, must be spicy n yum!! It can be pretty spicy but do tasty! Thanks Molly! I love them and so fun to make. Thanks Adriana!